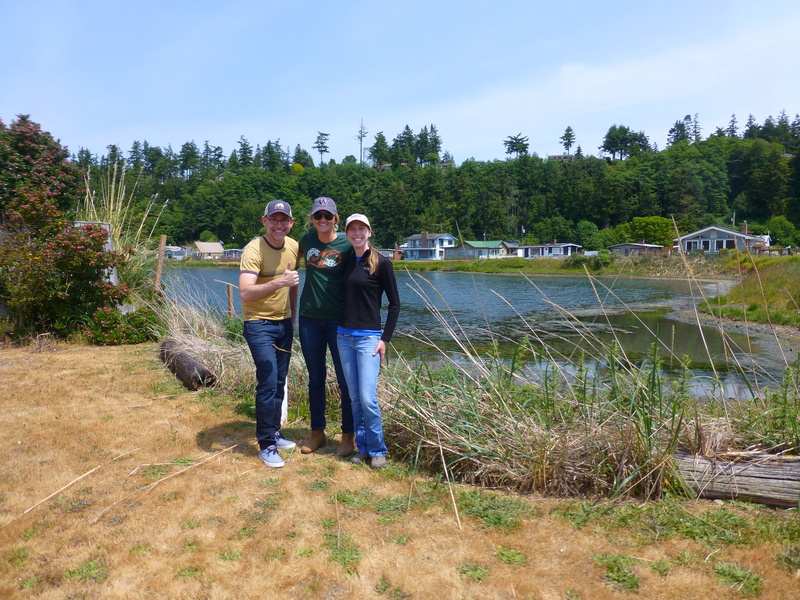 Last week, WSG Crab Team spent three full days in the mud at Lagoon Point on Whidbey Island. After two European green crab were discovered there last year, one during regular volunteer monitoring and a second during the subsequent rapid assessment, Crab Team HQ decided another multi-day trapping assessment could help us better understand the status of green crab at the site. One male European green crab was trapped during a total effort of 86 trap-days. While we might have been happier not to catch any green crab, we are certainly glad that we only found one. Each of the three days we were lucky to leave cloudy Seattle to find sunny weather on Whidbey Island, making the work in the deep, sticky mud more enjoyable. 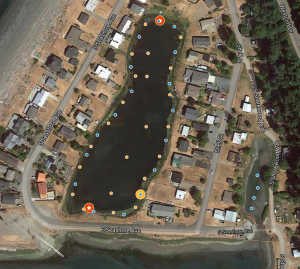 In contrast to our assessment trapping last fall, this time we concentrated all of the traps in the small enclosed lagoon, which is connected by a recently-repaired tide gate to the marina (see map). 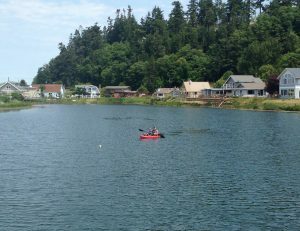 This lagoon is where both green crab were found last fall. While it’s certainly possible that green crab could also get into the deeper marina channels just to the south, the larger native crabs that live there would hopefully prevent them from surviving very long. As with any assessment trapping, we first had to work out a routine for efficiently setting a large number of traps “on the fly”. An assembly line system allowed us to quickly deploy 34 Fukui and minnow traps around the perimeter of the lagoon, and an additional four minnow traps in a small, open, muddy pool next to the lagoon. 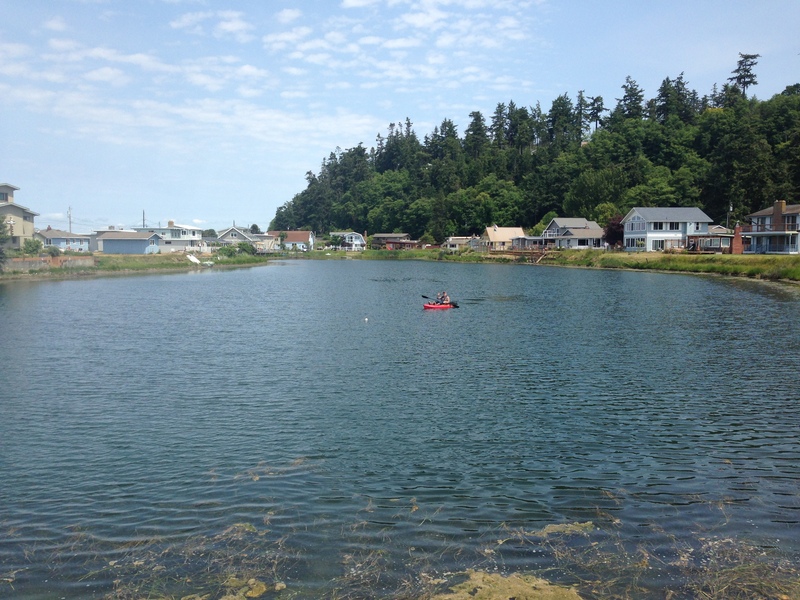 We also set a handful of traps in the middle of the large lagoon by kayak (thanks to Crab Team Project Lead Jeff Adams for lending us his), which was a very pleasant paddle. our way around almost the entire lagoon without much excitement (except for Program Assistant Kelly Martin taking an unintentional sit in the mud, her official initiation into Crab Team field work), Program Coordinator Emily Grason was just pointing out how smoothly things were going when Kelly pulled a minnow trap out of the water and there it was: a bright green, 57.5 mm, male European green crab. With a sigh (and maybe a curse), we began the process of measuring and photographing the crab, eventually placing it in a specimen bag to take back to HQ with us. The remaining traps that day yielded no additional invaders, and with the final trap pulled out of the water on the following day devoid of green crab, we packed up all our traps and made our way back to the University of Washington for an afternoon of cleaning gear. Back on campus, we took tissue samples from the crab captured at Lagoon Point to help build our genomics dataset and learn where green crab might be coming from (read the results of our recent genomics and oceanographic modeling studies to understand how green crab might be moving into and around the Salish Sea here). Crab Team’s Sean McDonald, Kelly Martin, and Emily Grason after three days of hard work! Based on the size of the crab we captured and the color of its underside, we can estimate a window of time when the crab might have gotten to Lagoon Point. What we would be concerned about is if this crab was part of a younger cohort (age group) than the crabs captured last fall. This would suggest either that the crabs living in the lagoon in 2017 had been able to successfully reproduce or that multiple waves of larvae washed into the area. The crab captured last week probably arrived around the same time as the crabs that were found last year, which is a bit reassuring. The fact that this was the only crab we captured despite our greater intensity of trapping in this smaller lagoon was also a relief. Green crab still have a presence in the lagoon at Lagoon Point, but their population has not exploded since last fall. Volunteers will continue the standard monthly trapping and surveys to keep a close eye on this spot, and we will ramp up trapping if there’s any evidence green crab are persistent or increasing in numbers. We are grateful to the residents of Lagoon Point Community Association for helping us access the site, and to Bridget Simon, Angela Cruz, and David Wilde who backed us up with more boots in the mud!